The Nokia 701 is one in Nokia phone series with new and enhanced Symbian Belle. 701 is similar to C7 in appearance. Its shiny stainless steel edge around the front has been replaced by matte plastic. It increases its beauty. Its 3.5-inch display covered by Corning’s Gorilla Glass transforms it into highly scratch resistant. In addition the display is a front facing camera, proximity sensor and the ambient light sensor, along with a prominent earpiece make it unique. Below the display there are three physical controls for the call, menu and end button from left to right, in that order. On top of the phone is a micro USB port under a cover with an LED lamp that glows whenever the phone is charging. Next to it is the 3.5mm headphone jack and the power button. 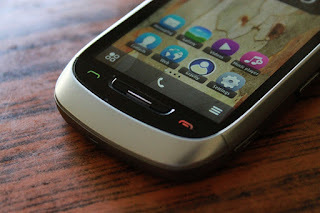 On the right side of the phone are the volume control buttons with the voice command button between them, the sliding phone lock switch and the camera shutter button. On the right is the traditional Nokia charger connector. The back of the device is made of metal. The battery cover is made of stainless steel. Above the battery there are camera lens and flash along with two loudspeaker grilles. However , this is a unique phone device offered by Nokia.